Advantages: Bi-lingual text; plenty of wartime photos; decal sheet included; attractive fold-out colour profiles (12 colour profiles in total); good coverage of operations and aces. Kagero has turned its attention to the famous VF-17 "Jolly Rogers". This soft-cover, small A5 format book comprises 80 glossy pages covering the VF-17 from its formation by LTCDR Tom Blackburn at the beginning of 1943, to the delivery of their first Corsairs (accompanied by experts from the Vought factory) in February of the same year, through training and deployment; until its final operations over Kikai in May 1945. The book is generously illustrated with images of the men and machines of the Jolly Rogers. Text is presented in Polish and English, with the languages appearing in different columns on the same page. This seems to work quite well. Despite the small page format, Kagero offers eight of the total twelve colour profiles on A4 foldout pages. The artwork is very attractive and depicts the different camouflage and markings of the unit quite well. 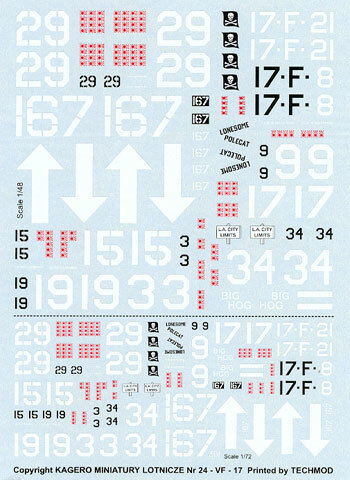 Even better for modellers, all twelve subjects are supplied on a decal sheet in both 1/72 and 1/48 scales. Only unique markings are supplied for each aircraft - no national markings or stencils are provided. 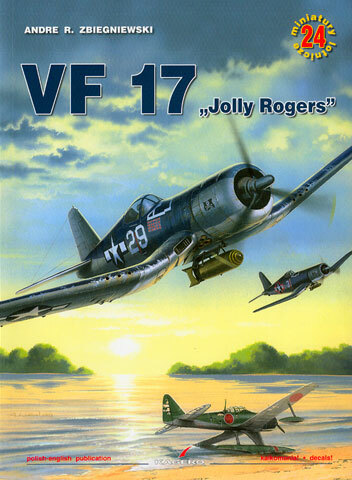 Kagero's "VF-17 Jolly Rogers" will be a helpful and compact book for modellers. The inclusion of photos, background information, colour profiles and decals all in a single package makes this book a very tidy one-stop reference source.